If you’ve grown up with the tradition of having a fresh-cut Christmas tree in your home, it’s likely that at some point you’ve had a Douglas Fir. According to the National Christmas Tree Association, the Douglas-fir Christmas trees (Pseudotsuga menziesii) have widely been the most popular for Christmas trees in the United States since the 1920s, today being shipped to the majority of states including Hawaii, and also Guam and Asia. The Douglas Fir also goes by names such as red fir, Oregon pine, and Douglas spruce. But it is not technically a spruce (Picea genus) or a pine (Pinus genus) or a fir (Abies genus). The genus name, Pseudotsuga means “false hemlock,” yet another tree that it is similar to. They are evergreen trees (they keep their needle-like leaves all year). Douglas Firs can survive in a variety of climates including very dry, low elevation locations and moist sites. Another Pseudotsuga species, the Bigcone Douglas-fir, also grows in western North America, but because it only grows in South California and Baja, Mexico, it is not used as a Christmas tree. When grown in natural conditions, Douglas Firs can live for anywhere from 70 to 1,000 years. They have a thick bark that protects them from moderate fires and have been known to establish themselves after fires on wetter sites. Many ancient, old-growth forrests have Douglas Firs to honor the fires that happened long ago. The Douglas Fir is Oregon’s state tree. Native Americans used the wood and pine needles for building, creating baskets, and treating ailments including stomach aches, headaches, and the common cold. Douglas Firs are very widely used as timber for furniture, fences, flooring, and more. At Christmas Farms, Douglas Firs are a very popular option as are the Fraser Fir, Canaan Fir, Balsam Firs, Blue Spruce, and White Pine. On average throughout the year, we have more than 100,000 growing trees on our farm in Hartford, Michigan. We also feature the Douglas fir in our garlands and wreaths offered each Christmas season. We deliver via UPS to anywhere in the United States and you can pick which day it is delivered. So next season, when you’re deciding on your Christmas tree, you’ll know a little more about what you’re looking at. 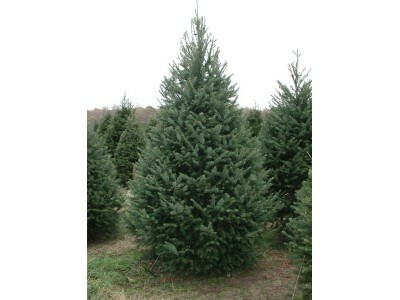 And if you pick the Douglas Fir, you know you’ll be welcoming in a long-standing Christmas tree favorite.